You can apply various effects for showing or hiding the title. Effects available to be applied to a title clip are saved in the title mixer of the [Effect] palette. 1Select a particular effect from title mixers in the [Effect] palette. 2Drag the effect to the mixer area below a title clip that is placed on the timeline. 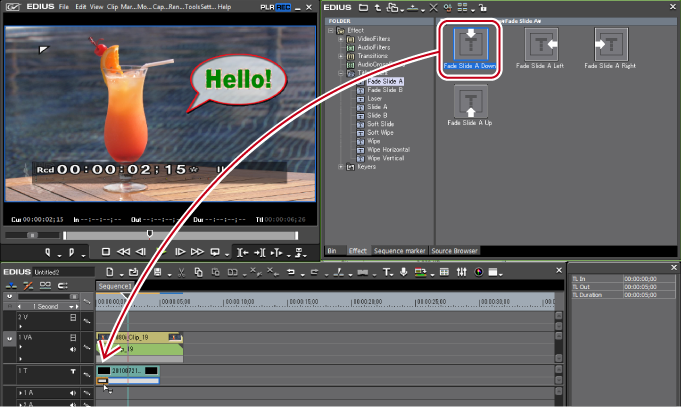 Move the timeline cursor over the title clip to confirm the effects applied. Select the mixer area of a title clip. Right-click the desired title mixer from the [Effect] palette, click [Add to Timeline] and then click the position in which to add it from [In], [Out] and [Both]. Select the mixer area of a title clip, and then drag and drop the desired title mixer from the [Effect] palette onto the effect list of the [Information] palette. When placing a title clip, the default title mixer is set automatically. You can change the automatic setting of the title mixer from [Source] in [User Settings] → [Duration].